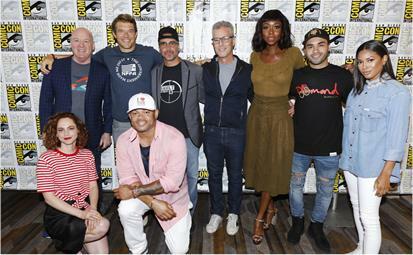 SAN DIEGO–USA Network in partnership with indie studio Blumhouse Productions and Universal Cable Productions brought ‘The Purge’ to San Diego Comic-Con in a big way! On Thursday, USA Network opened the doors of America’s first “Purge City” store, an immersive experience in the heart of San Diego’s Gaslamp District, to the public. Jason Blum, founder of Blumhouse Productions and producer of “The Purge” film franchise and the all-new series, and James DeMonaco, franchise creator and executive producer of “The Purge” films and ‘The Purge’ series, stopped by the one-stop shop “Purge City” to stock up on Purge night essentials and see the activation brought to life. Later that day, Blum and DeMonaco joined the cast and creators of the blockbuster film franchise and upcoming television series for a special panel that gave an exclusive inside look into how ‘The Purge’ is expanding its universe – highlighting the hit new feature film “The First Purge,” which is currently in theaters, as well as the upcoming television series, which will debut on USA Network on September 4 at 10/9 central time. Moderated by Ryan Turek, VP of Feature Film Development at Blumhouse Productions and co-host of Shock Waves Podcast, Blum and DeMonaco were joined on-stage by premiere episode director Anthony Hemingway (“Unsolved: The Murders of Tupac and the Notorious B.I.G.”); “The First Purge” star Lex Scott Davis (“SuperFly”); film franchise, THE PURGE series producer Brad Fuller (“A Quiet Place,” “The Texas Chainsaw Massacre”), series showrunner Tom Kelly, and series stars Gabriel Chavarria, Amanda Warren and Fiona Dourif.